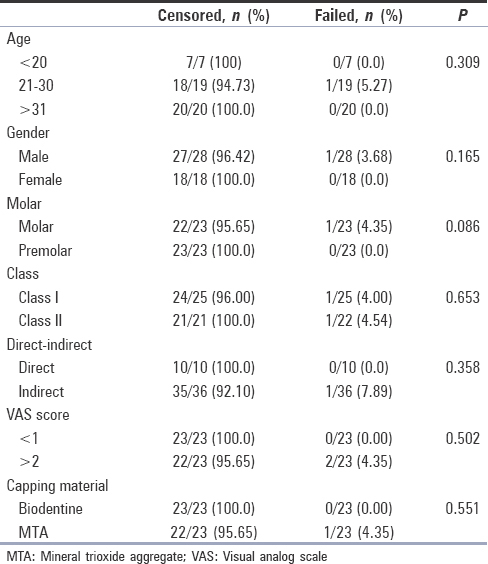 Introduction: The purpose of the present study was to evaluate the short-term clinical outcomes of pulp capping using mineral trioxide aggregate (MTA) Angelus (Angelus Londrina, PR, Brazil) or Biodentine (Septodont, Saint Maur des Fosses, France) as capping materials in a prospective randomized controlled study. Subjects and Methods: A total of 50 teeth were confirmed to eligible for pulp capping randomly assigned into either the MTA Angelus or the Biodentine Group (25 teeth per group). Direct\indirect pulp capping was performed using these two materials, and clinical and radiographical evaluations were performed at 0, 3, and 6 months after the treatments. Teeth with no response to pulp vitality test and those exhibiting clinical or radiographic signs and/or symptoms of irreversible pulpitis or pulp necrosis were considered to be failures. Results: Forty-five patients (47 teeth) were examined at the 6-month follow-up (patient recall rate = 92%); 23 of these teeth were in the MTA Angelus group, and 24 were in the Biodentine group. The overall success rate was 93%, and the success rates in the MTA Angelus and Biodentine groups were 95.5% (21/23 teeth) and 96% (23/24 teeth), respectively. Statistical analyses of these success rates did not reveal any significant difference between the groups. Conclusions: In this randomized controlled study, no significant difference in the short-term clinical outcomes of direct\indirect pulp capping using MTA Angelus or Biodentine as the capping material was found. The consequences of pulp exposure from caries, trauma, or unexpected during tooth preparation procedures can be severe with pain and infection. Vital pulp therapy procedures involve removal of local irritants and placement of a protective material directly or indirectly over the pulp. Ideal pulp capping agent should be biocompatible, encourage pulp, bone and periodontal ligament (PDL) repair, and sealing ability. Mineral trioxide aggregate (MTA), a calcium silicate-based cement, has been used as an eligible replacement for calcium hydroxide materials for treating pulpal wounds, as it has lower solubility, improved mechanical strength, and better sealing ability. However, MTA plagued with problems such as long initial setting time and poor physical properties. Biodentine (Septodont, Saint Maur des Fosses, France) is a new calcium silicate-based restorative cement with dentin such as mechanical properties, encourage dentin bridge formation with no inflammatory pulp response through secretion of transforming growth factor beta 1 (Laurent et al. ; Zanini et al. ; Nowicka et al.). Nowicka et al. compared the response of pulp-dentin complex in caries-free human molars which were scheduled for orthodontic extraction after direct pulp capping with Biodentine or MTA for 6 weeks. Biodentine had a similar efficacy in clinical setting like MTA. The capping ability of biodentine is comparable with that of MTA, but no clinical studies have evaluated both compounds simultaneously. The purpose of this prospective and randomized controlled clinical trail was to compare the clinical and radiographic outcome of MTA and Biodentine as a pulp capping agent. The study protocol was reviewed and approved by the Institutions Human Ethics Committee, University-Protocol number M8\RMMC\2015. Patient information sheets were distributed and informed written consent obtained before study commencement. Before patient recruitment, the sample size was calculated by the method of Walters with the assumption of the relatively normal distribution of the sample. With the expectation of a 10% mean difference between the control (MTA) and experimental groups (Biodentine), the minimum number of subjects needed to induce a statistical significance (P< 0.05) was calculated as 50 with a power of 0.80. This single-blinded, two-arm, randomized controlled clinical trial compared calcium silicate cement (Biodentine, Septodont) as the test material and MTA (Angelus) as the control. The study was not operator blinded because of the different clinical consistency and appearance of the two materials. Two groups were MTA Group and Biodentine Group. Twenty-five teeth were considered in each group. Teeth with periodontal lesions, internal or external root resorptions and patients with systemic medical conditions were excluded from the study. Patients were informed about the procedure and provided written informed consent after the study had been approved by the ethics commission of our institution. Pulp vitality was tested by submitting the tooth to thermal and electrical testing: a cold stimulus was given by the use of cold ice. Electrical testing was carried out using an electric pulp tester. Teeth without periapical or interradicular radiolucencies, furcation involvement, and widening of PDL space are included in the study. The level of preoperative pain recorded using simple visual analog scale (VAS) scoring. The VAS consisted of a line of 10 cm length anchored by two extremes with 0 cm signifying no pain and 10 cm representing the worst pain imaginable. Patients who experienced a preoperative pain score of more than 3 cm excluded from this trail. MTA (Angelus) or Biodentine (Septodont) were used as pulp capping agents. After administration of local anesthesia of the tooth, rubber dam isolation was provided and carious lesions were removed using a three-step procedure (1) high-speed carious enamel removal with a round diamond bur, (2) dentine mechanical curettage with a low-speed tungsten carbide bur, and (3) manual final dentine curettage using a spoon excavator. For indirect pulp capping, MTA (Angelus) powder was mixed with a sterile water in a 3:1 ratio, placed on the operative site with plastic amalgam carrier-like instruments and applied by light pressure with moist cotton pellets. Biodentine (Septodont) was prepared according to the manufacturer's instructions (1 capsule powder and 1 liquid using amalgamator) and placed on the prepared site using amalgam carrier such as instruments. The glass-ionomer cement was placed over MTA and Biodentine for 1 month. The definitive resin composite veneer restoration was placed 1 month after baseline in a closed sandwich technique where achievable. A standardized bonding procedure was followed for both groups. Direct pulp capping procedure-after pulp exposure and vitality confirmation (pink pulp and bleeds when touched but not excessively), the exposure and surrounding area were rinsed with water to remove debris. A cotton pellet moistened with 5.25% sodium hypochlorite was placed over the exposure for 1–2 min to control pulp hemorrhage and to disinfect the area. The cotton pellet was removed, and if bleeding continued, a new cotton pellet moistened in the sodium hypochlorite solution was reapplied for several min. This was repeated until bleeding was controlled or the practitioner decided that pulp capping was not appropriate. The pulp-capping agent (3 mm thickness) was then applied. The pulp capping material placed on the pulp exposure site. Restoration was done same like indirect pulp capping [Figure 1] and [Figure 2]. A simple randomization was used with a single sequence of random assignment without any restriction. The first tooth was randomly assigned to MTA (Angelus) and second was Biodentine (Septodont), and 25 following cases were alternatively assigned to either MTA (Angelus) or Biodentine (Septodont) Clinical and radiographical follow-ups were carried out at baseline, 6 months [Figure 3] and [Figure 4]. The treatment was considered to be clinically successful when the pulp remain vital with normal response to thermal and electrical thermal tests without signs of spontaneous pain, and VAS score is 0. The treatment was radiographically considered successful when there was no furcation radiolucency and PDL space widening internal or external root resorptions. These tests were carried out at baseline before pulp capping and at the 6th month postoperative follow-up visits. Results were statistically analyzed using ANOVA, Paired t-test, and Chi-square test [Table 1] and [Table 2], [Figure 5]. The results of vitality assessment in Group 1 comparison of baseline and follow-up at 6 months showed no significant results with P = 0.328 (P > 0.01). The radiographic assessment of periapical changes using RVG results showed there was no significant change in Group 1 with P = 0.328 (P > 0.001). The result of Group 1 has shown a mean VAS score of 1.46 preoperatively followed by postoperatively 0.29 after 6 months with the value of 0.001 (P< 0.01) which is clinically significant. The results of vitality assessment in Group 2 comparison of baseline and follow-up at 6 months showed no significant results with P = 0.083 (P > 0.01). The radiographic assessment of periapical changes using RVG results showed that there was no significant change in Group 2 with P = 0.162. (P > 0.01) The result of Group 2 has shown a mean VAS score of 1.42 preoperatively followed by postoperatively 0.71 after 6 months with the value of 0.047 (P< 0.01) which is clinically significant. In vitality assessment, comparison of Group 1 and Group 2, P = 0.044 (P > 0.01) which was statistically significant. Intercomparison of mean value of VAS between Group 1 showed 0.29 and Group 2 showed 0.71 with P = 0.285 (P > 0.01) which is clinically not significant. In radiographic assessment, intercomparison of Group 1 and Group 2 also showed P = 0.561 (P > 0.01) which was statistically not significant [Figure 6]. Raslon and Wetzel stated that the pulp exposed by trauma showed fewer inflammatory reactions and no regressive changes in comparison with the pulp exposed because of caries. Hence, only permanent teeth affected by deep caries were recruited for this study. Molars and premolars were selected because of staining potential of MTA as it has bismuth oxide. However, Biodentine does not cause discoloration as it has zirconium oxide as radiopacifier. In this study, Biodentine was compared with that of MTA when used as a pulp capping agent in patients diagnosed clinically and radiographically as reversible pulpitis. The materials were selected as they have similar clinical application as a pulp capping agent. The length of time necessary for adequate postoperative follow-up is unclear. Matsuo et al. suggested that 3 months was adequate for tentative prognosis because the success rates of groups having postoperative follow-up periods of 3–18 months were similar. In addition, previous studies evaluated the effect of capping materials had postoperative follow-up periods <4 months and in that period prognosis and determination were presented as success or failure for calcium hydroxide and MTA materials. Taking into considerations of the previous studies, in the present study, short-term clinical outcomes observed at the 6 months follow-up were found to be sufficient to make tentative prognosis of the final restorations. However, long-term clinical outcomes are necessary to prove the reliability of pulp capping with Biodentine. The treatment was considered to be clinically successful when the pulp remains vital with normal response to thermal and electrical thermal tests without signs of spontaneous pain, and VAS score is 0. The treatment was radiographically considered successful when there was no furcation radiolucency and PDL space widening internal or external root resorptions. Statistical analysis of baseline parameter showed no significant difference among the groups, thus confirming equal and homogenous distribution of the samples among two groups (successful randomization) In our study, patients were interviewed exactly about their symptoms by explaining how their descriptions might affect the treatment they received. Results showed a significant positive correlation between symptom intensity and treatment outcome. The results of our study showed a significant reduction in postoperative pain score values when compared to preoperative pain values irrespective of the pulp capping material used. 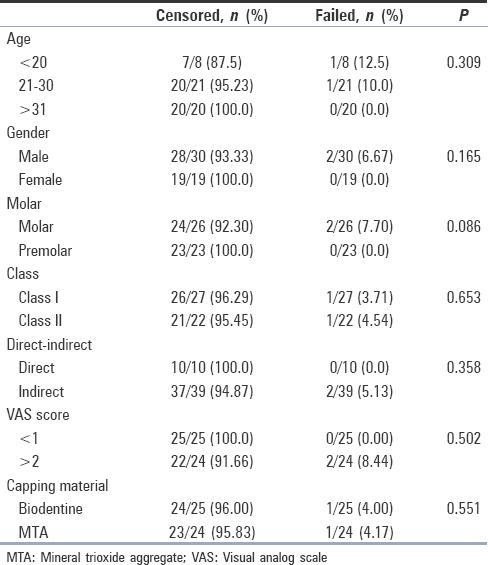 The results of study correlate with Jang et al., who compared the clinical outcomes of direct pulp capping with ProRoot MTA and Endocem in a prospective randomized controlled clinical trail. Both MTA and Endocem exhibited a similar results of VAS score. Sultana et al. also reported reduction in VAS score after 6 months of indirect pulp capping with MTA and calcium hydroxide in permanent teeth. However, there was significant difference between MTA and calcium hydroxide groups. The success rate of clinical assessment at 3rd month for Group 1 is 96% and Group 2 is 95.83%, the success rate of clinical and radiographic assessment from 3rd to 6th month is 100% of Group 1 and 96% of Group 2. Hence, the cumulative success rate of both clinical and radiographic assessment of Group 1 is 95.83% and Group 2 is 91.67%. When looking at these success rates and with regard to the potential toxic effects of the capping materials, we considered, as reported by Pashley, that there was no difference between direct and indirect pulp capping for the restoration of deep cavities, because of the fast increase in dentine permeability near the pulp. In deep cavities with a residual thickness of dentine of <0.5 mm, the number and size of open tubuli are such that communication with the pulp is comparable with that of a true pulp. The results of our study correlates with Jang et al., clinical trial reported that MTA and Endocem showed 95.5% and 90.5% success rates, respectively. Consistent with these results, Marques et al. reported a 91.3% overall success rates for direct pulp capping with MTA. Hashem et al. reported that although both Biodentine and Fuji IX are clinically effective when used as indirect pulp capping materials in teeth with reversible pulpitis, cone-beam computed tomography (CBCT) demonstrated a statistically significant difference between the two materials. The majority of teeth with healing/healed lesions identified using CBCT had received Biodentine whereas the majority of teeth with new/progressing lesions had received Fuji IX. The assessment of pain and pulp vitality at 6 months following completion of treatment revealed that there was no pain in 22 out of 24 (92%) of MTA and 23 of 24 (96%) of Biodentine treated teeth which were positively (normal) respond to pulp vitality test. In this study, failure occurred in one of the cases in the MTA group because of the loss of the restoration material. Whereas in case of intact restoration, the probable reason for failure of another case could be due to microleakage. In one of the cases of Biodentine group, the failure was Class 1 with buccal extension involving cervical region. The cervical region adjacent to the alveolar bone crest is the place at which the tensile stress is concentrated under occlusal loading, which might cause subclinical bonding failure. The criteria used to determine a successful radiographic outcome were absence of inter radicular or periapical radiolucencies, absence of increased PDL space, and absence of resorptive defects. The radiographic assessment revealed that periapical radiolucency in one case and increased widening of PDL space in another case of MTA group (92%). In one case of Biodentine group, radiographic assessment revealed widening of PDL space (96%). The difference noted between Biodentine and MTA could be related the release of a greater amount of ions during the initial setting, reducing ion release over time and consequently producing more favorable conditions for pulpal repair. MTA which has a longer setting time also provides ion release for a longer time. Moreover, hydration of the calcium oxide contained in MTA may result in an exothermic reaction, which could produce less favorable conditions for pulpal repair. Within the limitations of results of this short-term clinical and radiographic study, a higher success rate was observed in the Biodentine group relative to the MTA group after 6 months, but which was not statistically significant. Furthermore, the favorable short-term outcome success rate of 96% indicates that pulp capping may be a reliable treatment for pulp exposure in adult teeth. Leye Benoist F, Gaye Ndiaye F, Kane AW, Benoist HM, Farge P. Evaluation of mineral trioxide aggregate (MTA) versus calcium hydroxide cement (Dycal ®) in the formation of a dentine bridge: A randomised controlled trial. 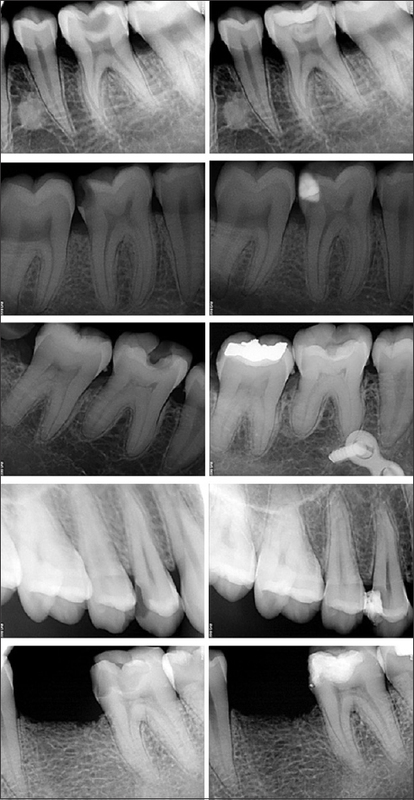 Int Dent J 2012;62:33-9. Asgary S, Fazlyab M, Sabbagh S, Eghbal MJ. Outcomes of different vital pulp therapy techniques on symptomatic permanent teeth: A case series. Iran Endod J 2014;9:295-300. Ajas A, Babu A, Varughese JM, Amal S, Thaha KA. Biodentine – An alternative to MTA? Review article. Arch Dent Med Res 2016;2:26-33. Caicedo R, Abbott PV, Alongi DJ, Alarcon MY. Clinical, radiographic and histological analysis of the effects of mineral trioxide aggregate used in direct pulp capping and pulpotomies of primary teeth. Aust Dent J 2006;51:297-305. Walters SJ. Sample size and power estimation for studies with health related quality of life outcomes :a comparison of four methods using the SF-36 Health Qual life outcomes 2004;2:26. Raslan N, Wetzel WE. Exposed human pulp caused by trauma and/or caries in primary dentition: A histological evaluation. Dent Traumatol 2006;22:145-53. Camilleri J. Staining potential of neo MTA plus, MTA plus, and biodentine used for pulpotomy procedures. J Endod 2015;41:1139-45. Matsuo T, Nakanishi T, Shimizu H, Ebisu S. A clinical study of direct pulp capping applied to carious-exposed pulps. J Endod 1996;22:551-6. Jang Y, Song M, Yoo IS, Song Y, Roh BD, Kim E, et al. 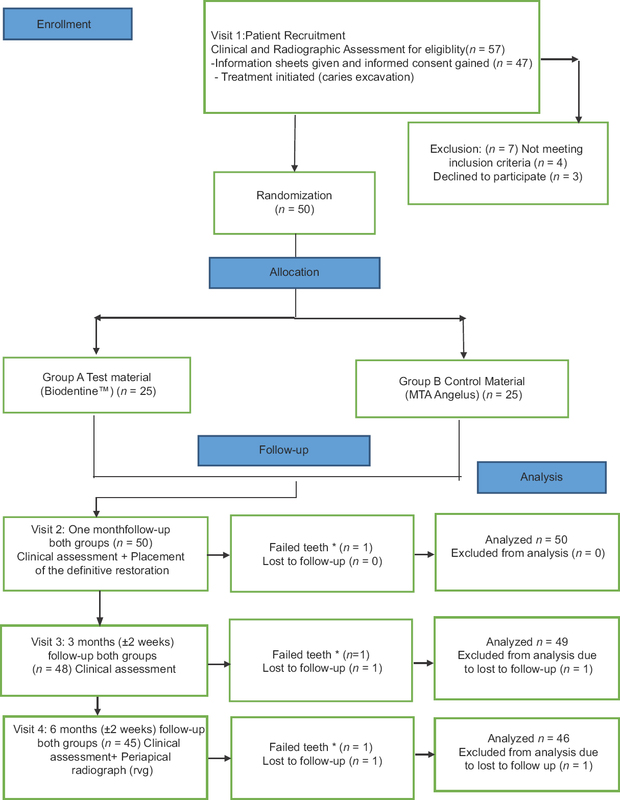 Arandomized controlled study of the use of ProRoot mineral trioxide aggregate and endocem as direct pulp capping materials: 3-month versus 1-year outcomes. J Endod 2015;41:1201-6. 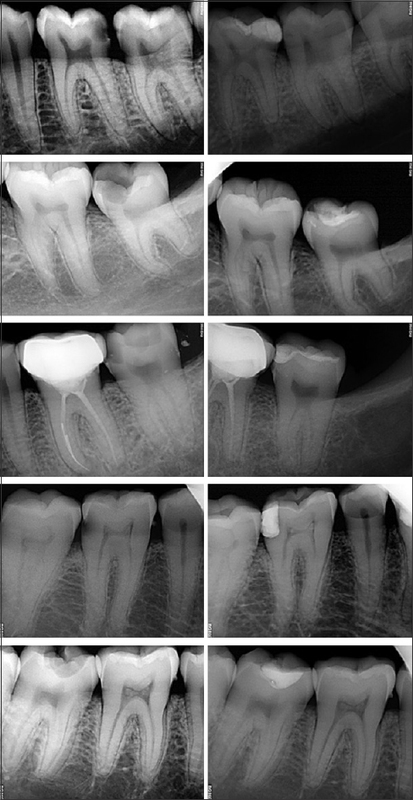 Sultana R, Hossain M, Alam S. Evaluation of clinical and radiological outcomes of mineral trioxide aggregate and calcium hydroxide as indirect pulp capping agents in the treatment of deep carious lesion of permanent teeth. Bangabandhu Sheikh Mujib Med Univ J 2016;9:3.